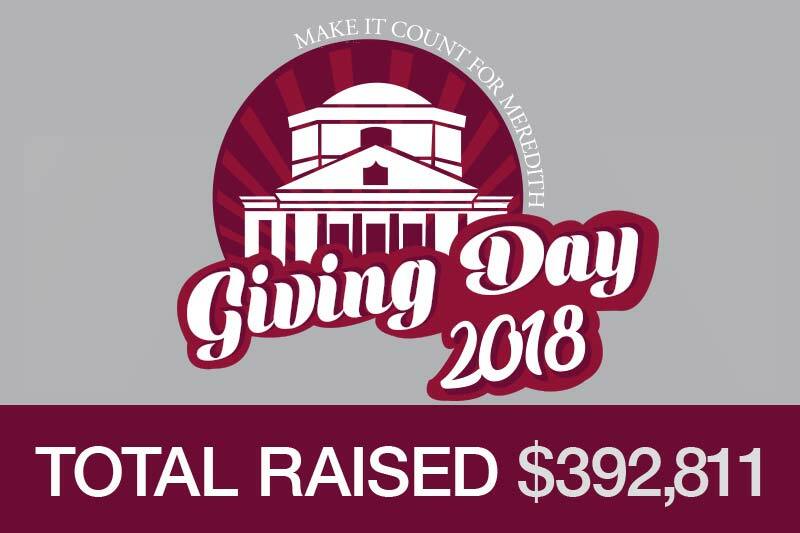 Meredith College held its third annual Make It Count for Meredith Giving Day on February 27, 2018. A total of 1,865 donors contributed $392,811 during the 24 hours. Donors were asked to honor the strong woman in their life with a gift and were able to designate where they wanted their gift to make an impact. The Giving Day goal of $350,000 was met by 8 p.m., so then the focus was on how far above the goal donors would push by midnight. An additional $42,811 was raised in four hours ending with 112% of the original goal. Various matching gifts throughout the day from the Board of Trustees, Meredith Parents Council families, the Alumnae Association Board of Directors, the Young Alumnae Board, and other alumnae helped motivated donors to give. A three hour-long challenge between the Odd and Even classes showed the competitive spirit of Meredith as well. The Evens won this challenge though the Odds had the most donors for the day. Facebook Live broadcasts from students, alumnae, and faculty kept the social media audience engaged and allowed donors to share their personal stories of the strong women they had honored. Donors were encouraged throughout the day to post their photos using #MakeItCount4MC to create awareness of the giving campaign and to promote why giving to Meredith was so important. Visit meredith.edu/makeitcount4mc to view final totals by class and state. The Meredith Fund, who organized the event, is thankful to all the donors who contributed and designated their gifts to make a difference. Make It Count for Meredith Giving Day was part of Beyond Strong │The Campaign for Meredith, which has raised more than $70 million to date.